After an incredibly busy start to 2017 I am really looking forward to submersing myself in the beautiful surrounds of River Cottage HQ with its rolling green pasture and fresh clean air. This year I had my first solo exhibition in London and have published two books, so it really has been quite busy. With so much work I find it is easy to forget what it is I am supposed to be doing, I forget the message behind my work and everything gets a little too complicated. Being able to visit River Cottage this summer is a real boon - it’s time for me to get back to roots and to mingle with the plants and the people. So what is it that I actually do? 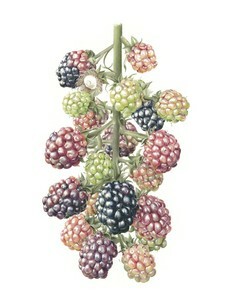 Well, I am a botanical painter who specialises in painting large watercolour paintings of plants. I have a particular fondness for depicting edible plants and I like playing around with light and scale, often magnifying parts of the plants to reveal all of the tiny details. When I paint plants I try to become them. There is a great deal of observation involved even before my brushes touch the paper. I believe that a good picture is made using not only sight, but also touch, sound, smell and movement. One has to be aware of all of these elements in order to portray the plant well and describe the space that the plant is growing into, both over and underground. I originally trained in botany before committing myself fully to painting so that I would understand the processes of plants more comprehensively. Now, as a botanical artist, I am constantly exploring divergent approaches to observation in order to inspire people to think beyond their own interactions with botany; to bring greater awareness of plants and to help us understand our interaction with them. An advocate of environmental protection, I have always admired the work that River Cottage does. I believe very strongly that the importance of our environment and its management does not just sit within the governmental and scientific debate, but that it enters our social fabric and becomes part of us culturally. As a botanical illustrator, I am always adopting new contemporary approaches to my work to highlight the importance of our environment and I enjoy reaching out to people by talking about my work on site. I am very much looking forward to my time at River Cottage because I feel that the farm offers the perfect space where I can do just this. It will be fascinating to be able to dialogue with the gardeners, to be able to paint the produce with my brushes and to be able to talk with visitors about the work that I am doing. 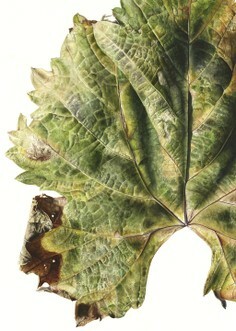 My hope is that my painting will encourage you to look at the flora differently. I want to show you all the beauty in leaves, roots and flowers so that you really get a full experience of the plants that end up on your plate! So if you are visiting River Cottage this June, please do come and find me, it would be marvellous to meet you.